With the government set to run out of funds in a few short days, immigration detention has become a central issue in Congress’s debate over how to spend taxpayer money in the U.S. immigration system. The goal of this explainer is to ground these discussions in reality amidst misinformation from many sources and a quickly changing debate. One of the primary sticking points in the spending negotiations, according to media reports, is an effort to decrease the Department of Homeland Security’s reliance on jails and prisons to lock up people who are in immigration proceedings. The Trump administration has expanded the immigration detention system by approximately 40 percent and now jails nearly 50,000 people on any given day, up from an average of about 34,000 people per day under the previous administration. The people being locked up by the administration fall into roughly two categories: 1) About half are community members who were arrested inside the United States by Immigration and Customs Enforcement (ICE) and are defending against their deportation; and 2) The other half are individuals who arrived at the border or airports and were immediately detained by Customs and Border Protection (CBP) and then transferred to ICE custody, including those seeking safety through asylum or other protections. The current stalemate in negotiations is centered around a “detention cap”--an attempt to intervene in a three-year pattern of unaccountable overspending by ICE. Democratic negotiators have proposed decreasing ICE’s overall budget for detention to fund the lock-up of about 35,000 people per day, while imposing an oversight mechanism that limits the number of people ICE can lock up inside the country to 16,500. Negotiators have not proposed a similar limit on ICE’sdetention of asylum seekers and other individuals apprehended on the border or at airports. Overall, the strategy now unfolding is an attempt to return the detention system to where it was at the end of the Obama administration, a time when detention was already artificially inflated by what was known as the detention bed quota. The oversight mechanism that would be put in place to govern this limitation, however, would only restrict ICE’s detention authority as it relates to individuals arrested in the community. While this restriction is a critical step forward, it would not preclude ICE from repeating its proven pattern of raiding other parts of its budget to make up for overspending on detention for those apprehended upon arrival to the United States. Congress is long overdue in imposing stricter oversight mechanisms on ICE’s detention spending. The massive scale of the current detention population is historically anomalous. The idea that ICE should rely this heavily on jailing asylum seekers and undocumented people during their deportation proceedings is very new. Only a few years ago, ICE managed its interior and border apprehension population with far fewer beds. In 2016, the Average Daily Population (ADP) in detention was 34,376. In FY 2002, another politically precarious time after September 11th, the ADP was 19,922. In 2000, the ADP was 19,458. In 1994, the ADP was 6,785. ICE has gone on a massive detention expansion spree, including during the government shutdown and right in the midst of delicate negotiations in Congress over funding. Currently, Congress has appropriated funding to ICE to detain 40,500 individuals per day, yet ICE now is currently detaining over 49,000 individuals. ICE previously has raided other government accounts to pay for detention expansion, including taking money from the Federal Emergency Management Administration in 2018, as the East Coast headed into hurricane season. ICE has repeatedly taken advantage of continuing resolutions to expand detention with the assumption that Congress will bail them out. What the Democrats are getting right in the current negotiations is the need for oversight to rein in an agency that has flouted the Constitution, which provides Congress the power of the purse. This oversight needs to be focused on the agency’s reckless behavior that puts the safety of those in its custody at risk and significant limits on the agency’s ability to transfer and reprogram funds. The administration is using outright falsehoods to oppose Congress’s effort to rein in ICE. 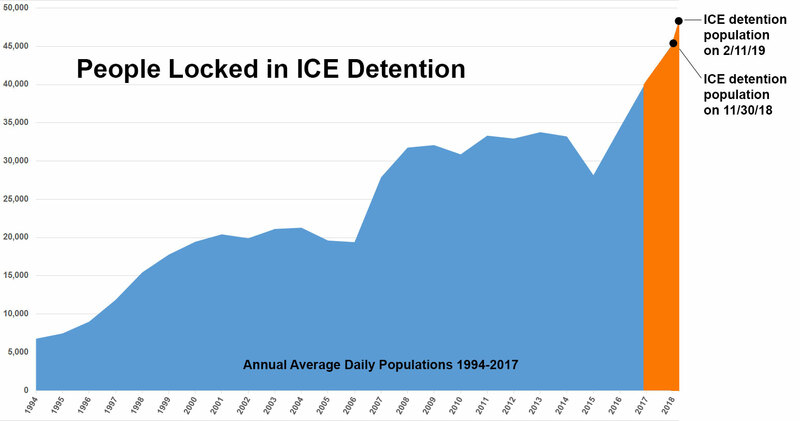 Immigration detention is not about community safety, and negotiators shouldn’t fall for the Trump administration’s criminalizing rhetoric — especially when their own data shows that they too know better. The cost of ICE detention goes beyond tax dollars: ICE is operating its jails at the expense of human life and dignity. Often forgotten in the noise of spending negotiations are the systemic abuses that occur within ICE custody. ICE’s rapid expansion of the detention system in recent months has resulted in a dangerous worsening of already life-threatening conditions. In Texas, ICE is force-feeding and threatening with deportation nine asylum seekers from the Indian state of Punjab who dared to assert their rights to non-violent protest of the conditions in which they are jailed. ICE is jailing more than 100 transgender individuals in 20 different jails across the United States, none of which have contract provisions that would bring them in line with ICE’s own proposed guidelines for transgender individuals in detention. These individuals are struggling to access counsel, jailed in isolated facilities with insufficient access to hormones and limited or no ability to meet the unique needs of LGBTQI individuals. Many of the transgender women have been put in solitary confinement, with even worse access to needed medical care and services. Sexual abuse is rampant and unchecked throughout immigration jails, with hundreds of complaints going unanswered. To increase their bottom line profits, private prison companies and ICE rely on the free or low wage labor of immigrants in detention who are frequently paid $1 per day for demeaning tasks, money they use to pay the exorbitant phone rates to speak with their loved ones or to buy food at inflated prices from the facility’s commissary. ICE continues to jail mothers and fathers with their young children, even as DHS’s own medical consultants warn publicly of the “high risk of harm” such practices cause young children. People are dying in immigration jails, and medical experts and non-government organizations have repeatedly documented medical negligence by ICE or its contracts to be responsible for at least half of the deaths that occur. In order to expand detention at a rapid rate, ICE has resorted to buying plastic platforms to purposefully overcrowd detention centers while barely complying with laws that govern conditions of confinement. Such overcrowding is a serious concern for immigrant safety, as it may result in inadequate medical staffing and increased use of force by guards. In recent months and years DHS’s own watchdog agency has issued numerous reports documenting systemic corruption and abuses within the detention system, including sham inspections that do not result in harm mitigation, contract mechanisms that give contractors a blank check to violate basic detention standards, and conditions so dangerous as to put the health and safety of individuals detention at risk. Every dollar given to ICE for detention is a dollar that is putting lives at risk. Heidi Altman (email) is NIJC's policy director and Mary Small (email) is policy director for the Detention Watch Network (DWN); they are available via email to answer questions about this explainer. Amy Fischer of DWN and Tara Tidwell Cullen of NIJC contributed to this blog post.